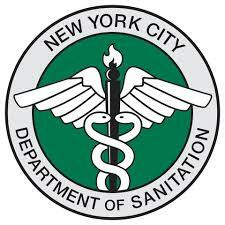 Over the last several weeks I have had the pleasure of working for New York City’s Department of Sanitation (DSNY) as an Organics Outreach Graduate Intern. Most broadly DSNY is concerned with the collection of all residential trash and recycling, street cleaning, and snow removal within the 5 boroughs. This summer I am working within the Bureau of Recycling and Sustainability on the Organics Collection Program doing a variety of tasks both in our office in lower Manhattan, and across the five boroughs. 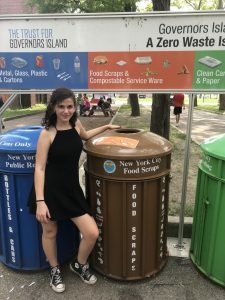 I look at reports that show exactly how many organics bins are put out by each residence on every collection day in all of Manhattan and most of the Bronx. I input this data to an Excel spreadsheet to be analyzed for future route changes and outreach opportunities. Buildings with 9 or fewer apartments are refused to as “low rise” buildings. Using an online GIS program and the information on the inquiry, I identify whether the building is eligible and then respond accordingly. For buildings that already receive service, but have had their bin lost or stolen, residents can request replacements. I order those buildings new bins, and redirect them to our map of food scrap drop-off sites. Residents can take their food scraps to these sites until their replacement bins are delivered. This is the most creative project I’m working on. We are designing building profiles that will act as case studies of successful outreach for different building types. Ideally, these profiles will act as a template for buildings interested in organics collection in the future. DSNY will be able to identify how the organics program can work in buildings with different infrastructure (existing trash chutes, common spaces, etc.) and varying sizes (from buildings with fewer than 10 units to those that have more than 500). But these projects are not the full extent of my internship. At least a few times per week, I go on “site visits” to buildings that have expressed interest in receiving organics collection service. At a site visit I meet with a building’s superintendent, property manager, board members–sometimes individually or all together. Site visits usually start with a basic tour of the building’s recycling and garbage management. During the visit I explain the details of the brown bin and collection schedules, while answering questions and addressing concerns. I could write forever on the interesting experiences I’ve had on site visits–but that’s a blog post for another day. My favorite part of doing site visits is getting to see new buildings and neighborhoods. I’ve taken almost every subway line since starting this position and gotten to see parts of the city I didn’t know existed. 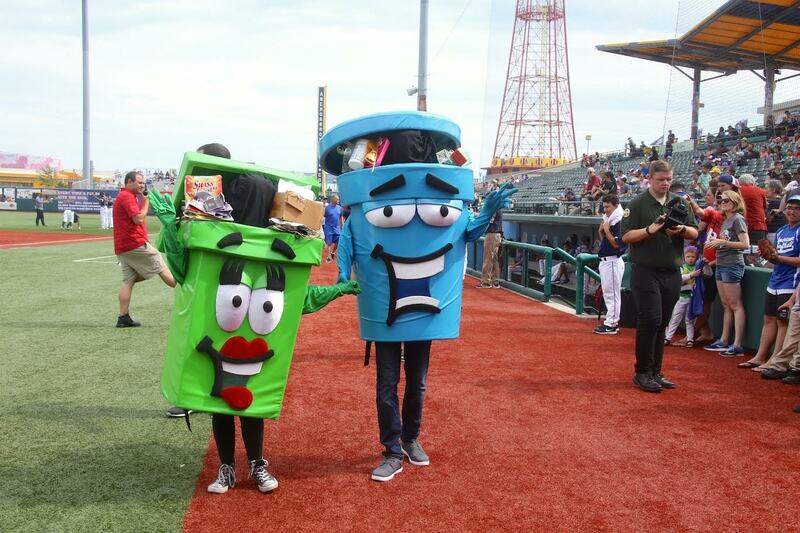 Green Bin and Blue Bin at a Brooklyn Cyclones game. My identity is given away by my height and my Converse. Photo taken by Michael Anton, DSNY photographer. Perhaps the most exciting thing to come out of this internship is a task I asked for, but am not required to do: mascotting. That’s right! Not only only do I have the privilege of working for the only government agency I know with a mascot, but DSNY has 5! We have one for each bin (blue and green for recycling, a silver zero waste trash can, a brown one for organics, and a leaf bag). 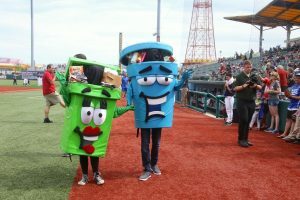 So far I’ve gotten to wear green bin, blue bin, and the zero waste trash can at several events, including two minor league baseball games! I made my minor league debut at the Staten Island Yankees game, where I actually got to be on the field between innings. It’s been a silly, but refreshing addition to a 9 to 5 schedule I’m still adjusting to. In all the excitement, it’s easy to forget that my position is fulfilling an internship requirement at BCEP. Spring semester feels like it was eons ago, and it’s still challenging for me to wrap my head around transitioning into writing my capstone. Finishing my first year at BCEP made me feel like I had run one marathon a week for several months straight, no thanks to the mono and recurring strep throat I was blessed with. But after some much needed time for healing and rest, I get to appreciate everything I got out of my first year. At DSNY I’m reminded of Gautam and his statistics course as I learn new excel formulas to make my data analysis more thorough. On site visits I think of Jen as I explain the nitty gritty of the composting process to those unfamiliar with the concept. Monique comes to mind as I consider the effects of NYC’s Organics Collection Program on federal environmental policy, or the influence NYC can have on other large cities designing organics programs of their own. And of course, I hear Caroline’s voice in my head as I give my spiel on the organics program to residents, superintendents and building management. I am not ready to leave DSNY yet. 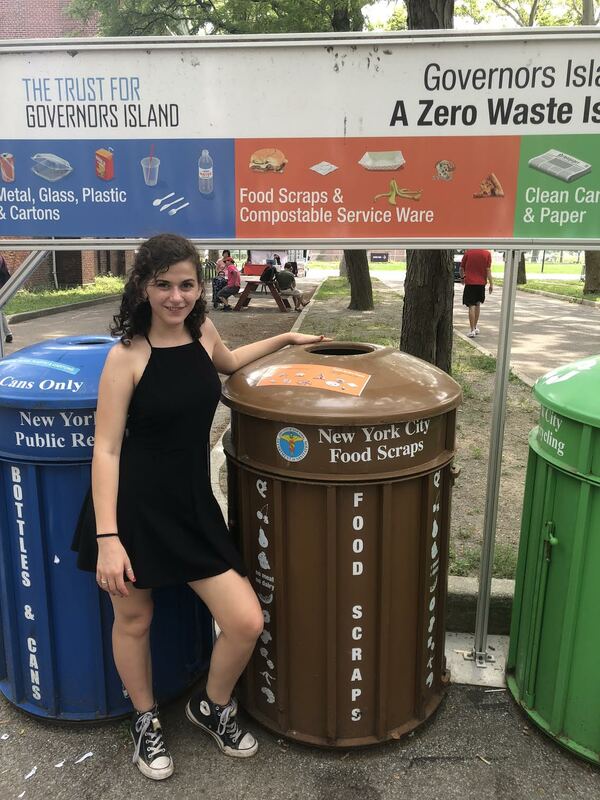 I cannot imagine a better place for my NYC pride to intersect with my interest in waste management, except maybe in the form of my capstone. For that reason, I am looking forward to taking my new experience in city government and applying it to my thesis over the next year. Very insightful! Never thought about all the hard work going into organics collection! Keep your fans updated on your progress! Very proud of your accomplishments! It’s so nice to learn that you’re involved in a variety of tasks, and how you’re using the skills learned in the classroom at DSNY. I’d love to see you in a mascot outfit — maybe you could present your capstone in May wearing one? Hi Allie! This is awesome, I’m so glad you got the most perfect internship for you. This may be outside the realm of your position, but I was wondering what happens to the organic waste after it is collected? Where it goes and what is the process. Also, curious about the growth of the program, doesn’t seem like people are interested in adding these organics receptacles? Does DSNY keep track of how much organic waste gets collected? 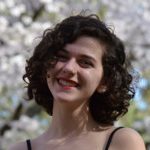 Great blog post, I really enjoyed it. Also, 100% agree with Gautam, wear the mascot uniform for your capstone presentation! Hi Lindsey! Not too far out of my realm, luckily. After the organics are collected, it’s taken to one of our compost facilities. There’s machinery to filter out the plastic bags and other contaminants, and then it is turned, put in piles, and given time to decompose. DSNY does keep track of the waste that is collected, both by weight and by # of bins put out on the curb. And lastly, interest is definitely high! Buildings (sometimes residents, sometimes management) inquire about the program in all boroughs. I think people are generally excited about it, and it’s been fun to see more and more of them around the city. I think this is super interesting! I’ve never heard of a city doing something like this before – I’ve heard of common drop off points, but not personal/complex-wide bins that they come around and collect. I think this is a great step and I wish more places did something like this! Do you find that more often than not you are reaching out to people to see if they are interested in getting a bin, or are people more likely to reach out to you? Hi Carolyn! Thanks for commenting. My internship was mostly dealing with building staff or residents who already reached out to DSNY. That being said, one really fun part of my outreach duties was explaining the program to people who were not familiar with it. That was often true in bigger buildings, where residents would sometimes join our site visits to ask questions. Luckily it never felt like I was pitching the program to anyone who didn’t want it–something I think is indicative of the open-mindedness of New Yorkers!